If you've been marketing online for more than 10 years, you might remember the 'cycling' craze that hit the Internet around that time. It was a sure way for members and site owners alike to make a lot of money quickly and easily. Now the interest has surfaced again, but this time in another guise with many more features to boast of. 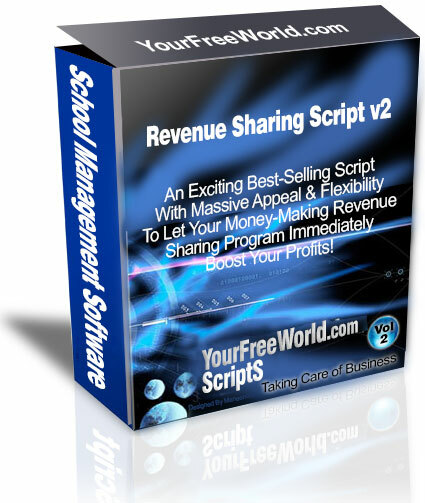 My revenue sharing script V2 has been updated to included extra features that have been requested by existing customers! Once you try it out for yourself, you'll understand exactly why this type of script is indeed so popular. In a nutshell, it builds a membership list very quickly, and generates a substantial income in a very short space of time. And now with even more features that guarantee the longevity of the program, it's even more highly sought after. One Thing Is ALWAYS Certain. People Want To Make Money NOW! Business Branding: The excitement generated by this script will make your site 'sticky', and naturally encourage your members to come back to your site time and time again to see how much they've earned. Due to the high activity your site will experience, your brand will gain more recognition in the marketplace. Enhancements: If you require enhancements to your script, it is available through our development team at reasonable rates. Facility to include popular payment processors like Payza, SolidTrustPay, Perfect Money, Bitcoin and with ability to add up to 5 extra merchant accounts as desired. NEW! PerfectMoney, STP IPN and mass pay facilities added for more payment processor choices and functionality. NEW! Bitcoin IPN now included for extra appeal. Maximum positions a person can own. Number of members who will be paid on each position purchased after deducting admin profit and referral profit. NEW! PIN withdrawl for added security. NEW! 125x125 banners included for sale to generate extra revenue. 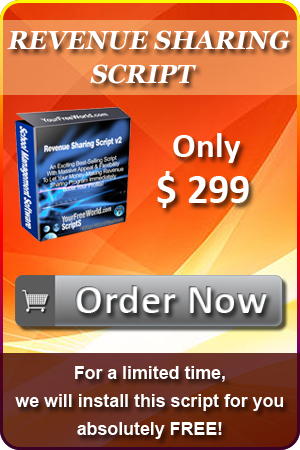 As you can see, there are some extra features that you won't normally find in other revenue sharing scripts. That and the super user-friendly interface makes our script a winner that users of any experience level will find easy-to-use. Purchase revenue sharing positions including repurchase from unpaid earnings facility. Manage positions shows statistics of each share. Promotional center with ad copy for affiliates to use in their external promotions. Test ad and banner ad setup and statistics. NEW! Front page includes total members, total payouts and total position statistics as social proof to attract more new members.